11/23/2018 | Global Collaboration | Holmberg, M., McCormick, A. This article is part-two, of a two-part series written by Margaret Holmberg and Ashley McCormick regarding the US based, international organization: The Alliance for the Advancement of Infant Mental Health (Alliance). All Alliance associations are encouraged to become a WAIMH affiliate: 26 of the 29 U.S. Alliance member associations are WAIMH Affiliates; 3 of the 29 member associations are in the process of applying/becoming a WAIMH Affiliate; and 2 international U.S. Alliance member associations are WAIMH Affiliates. Part One has been previously published online in Perspectives. Part One, outlined a brief history of the Alliance and identified current initiatives within the Alliance and introduces results of a 2017 survey conducted by the Alliance with a view to furthering understandings of: what makes an infant mental health association strong. All Alliance member associations were invited to participate. The results of this survey are aptly described by the authors as a consolidation of the “inspiring work of the Alliance association members”. The first two key finding areas of identity and cross-system collaboration were summarized as part of this impressive and far reaching national and international body of work in the field of infant mental health via a synopsis of a presentation: “What Makes an Infant Mental Health Association Strong?” by Ashley McCormick. To continue to address the question: What makes an infant mental health association strong?”, this article addresses the remaining five areas: competency-informed training; reflective supervision capacity; a sound organizational structure; policy; and higher education. What Makes an Infant Mental Health Association Strong? Competency-Informed Training: competency-informed or competency-based workshops, trainings and conferences that promote IECMH principles and practices; provided across disciplines to the infant, young child-family workforce. Many IMHA sought and successfully secured collaborative funding to provide trainings that infused IECMH principles and practices across a variety of service systems. Home visiting services grew in number and importance this past year, in large part due to federal funding to states through Maternal, Infant and Early Childhood Home Visiting (MIECHV). Recognizing the shared mission with IMH, IMHA in Alaska, Arizona, Florida, Idaho, Indiana, Kansas, Michigan, Oregon, Rhode Island and Wisconsin reported receiving funding to provide intensive competency-informed training and/or reflective supervision to programs like Parents as Teachers, Healthy Families America and Early Head Start/Head Start. Many IMHA received funding from Project LAUNCH. Although these funds were used in diverse ways, IMHA in Colorado, Florida, Pennsylvania, Washington and West Virginia used a portion of their funds to either provide competency-based IECMH trainings or send to their members to IECMH trainings. IMHA offered specialized programs in collaboration with Baby Casa training in Arizona, Baby Court in Michigan, Safe Babies Court Teams in Connecticut, Texas and Oklahoma and Safe and Secure Baby Court in Rhode Island. This meant that mental health and early childhood specialists provided training for staff working with or on behalf of infants, very young children and their families in judicial and child welfare settings, enhancing professionals’ knowledge of early development and behavior, influencing decisions and reducing the risk of continuing trauma and profound loss in infancy and early parenthood. Of similar focus, the Australian Association for Infant Mental Health – Western Australia (AAIMHI WA) developed a 2-day pilot training on Perinatal and Infant Mental Health for all staff working in Child Protective Services. The training content is aligned with the Competency Guidelines® and was developed in conjunction with Edith Cowan University. IMHA spent a great deal of effort in partnering with well recognized, birth to 3 and family organizations to establish crosswalks between training curricula and the Competency Guidelines® and to align and integrate their work. In instances where there are “gaps,” associations have developed trainings to fill those gaps. The Wisconsin Association for Infant Mental Health (WI-AIMH) was successful in aligning IMH with other groups. The association chaired a workgroup to revise and update/Infant-Toddler Pyramid Model training. The newly revised Infant-Toddler content integrates IMH concepts and competencies and includes materials and activities on reflective practices. Additionally, WI-AIMH offered Infant/Toddler training of trainers for Wisconsin technical assistance provides. The training is now offered by the approved trainers for Infant/Toddler Educators around the State. The training is Registry approved and meets YoungStar (QIRS) criteria. Important collaborations exist between state departments of health, human services and behavioral health and many IMHA. As a result, funding has been available to support training initiatives that benefit large numbers of staff working with birth to six and family services to embrace social and emotional development and relationship initiatives. The NJ-AIMH received a grant from the Department of Human Services to initiate a comprehensive training series, “Keeping Babies and Children in Mind: Professional Formation Series in Infant and Early Childhood Mental Health.” Funding allowed staff in counties who had not previously received training under funding from “Super Storm Sandy,” to schedule the “Keeping Babies and Children in Mind” training for their infant, early childhood-family workforce. The WI-AIMH partnered with the state’s Office of Children’s Mental Health to apply for and secure a three-year technical assistance grant through SAMHSA’s Center of Excellence on Infant/Early Childhood Mental Health Consultation. As part of a multi-year project, the Washington Association for Infant Mental Health (WA-AIMH) is working with the Washington Department of Health/Project LAUNCH to support cohorts of early learning providers in seeking Endorsement®. Professionals in the participating Project LAUNCH communities include both center-based and family home child care providers, and many of them serve military or Hispanic families. As part of this work, WA-AIMH is working to identify IECMH-relevant trainings that are offered to and/or required for early learning providers throughout the state and will be developing crosswalks that will map these trainings onto the Competency Guidelines®. The crosswalks will assist providers in identifying their level of preparation as an IMH professional and any gaps that may necessitate additional training. The Connecticut Association for Infant Mental Health (CT-AIMH) partnered with Department of Public Health and Office of Early Childhood, who provided funding for CT-AIMH to provide two-day early childhood obesity prevention training. Associations were thoughtful about how to best reach their members through professional development offerings. RIAIMH offered a monthly conversation series (3 sessions per topic) in Spring (March-May) focused on early regulation challenges; and Fall (Sept-Nov) focused on attachment principles in practice. They recruited local experts in research and clinical practice to lead these conversations. They had consistent attendance of 50-80 participants per session. An increased number of IMHA, including those from Alaska, Iowa, Minnesota, New Jersey, Texas, Virginia and West Virginia sponsored or co-sponsored online competency-based training opportunities. IMHA from Arizona, Idaho, Indiana, Kansas, Michigan, New Jersey, Oregon, Tennessee, Texas and Wisconsin offered an annual or biennial IMH conference as both a way to generate funding and to provide competency-based material to the IECMH workforce. All 25 of the associations demonstrated that providing ongoing professional development helps make an association strong as illustrated by their commitment to sponsoring or co-sponsoring of competency-informed workshops, trainings and/or conferences. Reflective Supervision/Consultation Capacity: commitment to building and sustaining reflective supervision/consultation (RSC) capacity within the IECMH field. As interest in RSC has increased across the country, MIECHV funded programs have turned to IMHA to enhance reflective practice skills. This has resulted in funding to support reflective supervision groups and reflective practice communities of learning across the country. Of additional importance, MIECHV has allocated funds to IMHA to assist in training home visiting supervisors over one and two years to engage effectively in reflective supervision with their staff. The shared commitment to building reflective capacity has strengthened understanding and forging relationships between IMHA and MIECHV funded program staff. Many IMHA are working in creative ways to increase RSC capacity throughout their state or region. Co-AIMH convened RSC leaders from across Colorado in two, half-day meetings in 2017 in an effort to respond to the increasing need to build the capacity for RSC. MI-AIMH and the Minnesota Association for Children’s Mental Health Infant and Early Childhood Division (MACMH-IEC) offered regular training opportunities on RSC to staff across disciplines and in various health, mental health and educational service settings. Associations in Alaska, Arizona, Indiana, Minnesota and Oregon reported on their use of virtual platforms to provide group RSC to those in geographically isolated or remote locations. CT-AIMH offered eight RSC groups to child welfare, Part C, Early Head Start and community partners. Child welfare, Part C and the Connecticut Head Start State Collaboration Office funded the groups. The impact of all of these efforts are wide-reaching in supporting multi-disciplinary professionals including early care and education, early intervention, mental health clinicians and child protective services. Many IMHA demonstrated effective and creative solutions to building capacity across service systems on behalf of the wellbeing of infants, very young children and families. Despite the creative solutions that some associations utilized, other associations expressed the need for support in regard to building capacity for reflective supervision. Sound Organizational Structure: roles and functions of the staff, Board of Directors, committees and others that make up the association; evolve, when necessary, to meet the needs of association members. IMHA committees are a tremendous asset to associations and often are the “engine” or “life blood,” that bring policies to practice. Most committee members serve in a voluntary capacity and serve a purposeful role that is distinct and separate from that of the Board of Directors. Many associations spoke of various committees that exist, including, but not limited to, the following: Endorsement, Membership, Marketing, Fundraising, Education, Professional Development, Training/Programming, Social Action, Messaging and Outreach. The Florida Association for Infant Mental Health (FAIMH) just recently joined the Alliance. As their association members begin work related to the competencies and Endorsement®, they developed Outreach and Marketing Committees of the Board to begin developing an outreach plan and messaging that will be used with various stakeholders either directly or peripherally involved with Endorsement®. IMHA chapters or regional hubs were developed in many associations to support the ongoing work of the Board of Directors and associations staff. The Florida, Michigan, Pennsylvania, Virginia, and Wisconsin associations all have regional chapters/hubs in their states to create smaller networks, convene monthly or quarterly meetings of members and to move the work of IECMH forward. AIMHiTN Board of Directors used their “who we are” and “what we do” to guide a two-day strategic planning retreat to identify early goals with regard to sustainability. To build on the discussions from the planning retreat, AIMHiTN is creating and convening a sustainability committee. This standing Board committee will be charged with fully developing a strategic plan, inclusive of fundraising, marketing, and sustainability plans. The committee will include members of the Board, the executive director and targeted community partners. All 25 IMHA have Boards of Directors and other integral partners who provide an essential organizing structure. However, some reported the need and desire for assistance in strengthening their Boards of Directors, bringing up new leaders and engaging in strategic planning. Consultation with experts regarding board functioning requires funding. This is an area of need expressed by multiple associations. Policy and Practice: social policy, advocacy and/or systems change that advance IECMH understanding, principles and practices. 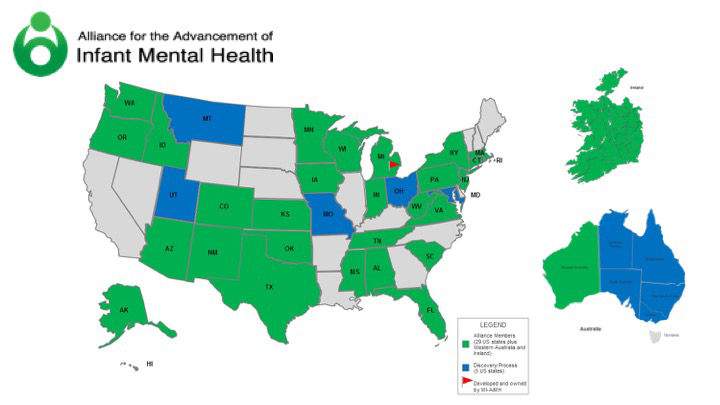 The Virginia Association for Infant Mental Health (VA-AIMH) and OK-AIMH both received grants from ZERO TO THREE for Training and Technical Assistance to begin to restructure the current Medicaid system. A VA-AIMH and OK-AIMH Board member sits on the lead team for the project. One important goal that was identified involves adoption of the DC: 0-5. The New Mexico Association for Infant Mental Health (NM-AIMH) Board supported the application of a member to be a partner in applying for the ZERO TO THREE IECMH Policy Convening for the 2018 year. If chosen, they would participate in national strategic planning network under the direction of ZERO TO THREE. New York State Association for Infant Mental Health (NYS-AIMH) was selected and participated in a ZERO TO THREE Learning Collaborative, “Enhancing Mental Health Capacity in Home Visiting: A Virtual Community of Practice for State Teams.” Additionally, they participated in the development of The “First 1000 Days on Medicaid,” a collaborative effort to bring together stakeholders to develop recommendations for a ten-point plan. The MI-AIMH Policy/Social Action Committee hosted an “Advocacy 101” training day in the fall. The committee met together in Lansing for a morning training on “Advocacy: Affecting Change,” and then spent the afternoon meeting state representatives. Conversations were focused on the promotion of IECMH. The Infant/Toddler Mental Health Coalition of Arizona (ITMHCA) reported that Best Practices for Infants and Toddlers in the Courts are gradually being implemented statewide (i.e., placement decisions, parent-child coaching for visits, encouraging foster parents to fall in love with kids, timely access to needed services, child-parent psychotherapy, trauma therapy for parents). IMHA leaders have a stake in the healthy social and emotional development of infants, young children and their families. As more IMH Board members and leaders join policy makers at the local, state and national levels, our public policies should reflect the values embedded in IECMH principles and practices. Higher education: relationships with colleges and universities; commitment to expanding understanding and use of IECMH via faculty, certificate programs, degree programs in academic institutions. CT-AIMH completed a crosswalk with Central CT State University (CCSU) to promote the inclusion of IMH competencies in higher education (IMH bachelor’s degree). CCSU received approval from the Board of Reagents for this new program and CT-AIMH will continue to support the addition of IMH content and courses into this program. Fielding Graduate University, PhD in Infant and Early Childhood Development (online/Santa Barbara, CA); this degree is designed for working professionals who wish to broaden their knowledge and understanding of infant and childhood development. University of Minnesota, Infant and Early Childhood Mental Health Certificate Program (St. Paul, MN); this online certificate program can be taken for academic credit or continuing education units. Portland State University, Graduate Certificate in Infant Toddler Mental Health (Portland, OR); this 20-credit, certificate is available online and is designed for professionals who are working with families who have children from the prenatal period to 36 months of age. University of Pittsburg, Infant Mental Health Certificate (Pittsburg, PA); this 18-credit, Post-Baccalaureate certificate is available within the Department of Applied Developmental Psychology. Wayne State University Merrill Palmer Skillman Institute, Dual Title in Infant Mental Health (Detroit, MI). Students earning an MSW or PhD in Social Work, a PhD in Psychology or a PhD or DNP in Nursing can earn a Dual-Title in Infant Mental Health. Many associations have developed resourceful strategies to form higher education connections. MACMH-IEC hosted a Faculty Symposium for educators from 2 and 4-year colleges. This opportunity provided the faculty with resources for embedding IMH practices into curriculum. The West Virginia Association for Infant/Toddler Mental Health (WV-AIMH) formed a Higher Education subcommittee to strengthen their relationships with colleges and universities throughout the state. This subcommittee is developing a survey to assess which IMH competencies are being integrated into current coursework across the state, as well as field experiences and child observation opportunities, qualifications of instructors, and what prerequisites are required. The hope is for this information to be used to develop a comprehensive plan to strengthen IMH-informed work across disciplines within higher education. The Oregon Infant Mental Health Association (ORIMHA) created a webinar on Endorsement® for Portland State University Graduate Students. NJ-AIMH developed an initiative to establish relationships with universities throughout New Jersey in order to promote awareness of IMH. This initiative includes presentations to faculty and graduate students and has a long-term goal of having graduate students join the NJ-AIMH Board. This will provide leadership and professional development to students, bring new energy and ideas to the Board, and establish relationships with universities offering graduate programs in IMH fields. By infusing IECMH competencies into higher education, associations are prioritizing the future of the infant, young-child family workforce.